Euphrates rivers. Here is a map of the region where the civilization flourished. 2100 BC they were back in control. 1900 BC established their capital at Babylon. Babylonian mathematics is to the right. and to calculate the total expenses of wages of the workers. texts in which various quantities concerning the digging of a canal are asked for. the system with base 10.
written as 5.425 in decimal notation. taking a quarter of the answer. ... an approximation is given since 7 does not divide. have the concept of a typical problem of a given type and a typical method to solve it. that all this was done without algebraic notation. given in the table by b. An example of a problem of this type is the following. from 1; 00 to get 0; 33, 20. 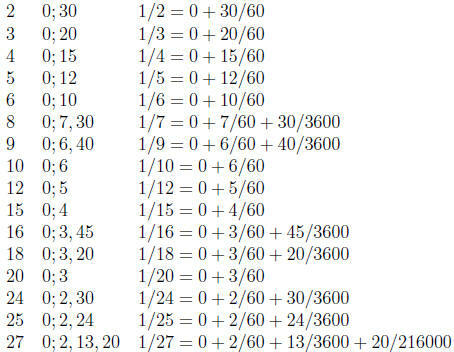 Look up the reciprocal of 0; 33, 20 in a table to get 1; 48. Multiply 1; 48 by 1, 40 to get the answer 3, 0. 180 (which is 1; 48 times 1, 40 to get 3, 0 in sexagesimal). To solve a quadratic equation the Babylonians essentially used the standard formula. they would apply the first version of the formula above. not given by the scribe who finds the answer as follows. Compute half of 7, namely 3;30, square it to get 12; 15.
leading to quadratic equations taken from Old Babylonian tablets. well over three thousand years.